What is the current status of your Mustang hobby? Thread: What is the current status of your Mustang hobby? Make sure your Mustang is smoking pretty badly when you do it. It helps make the Porsche owner feel even lesser a human when a old smoking car beats them. I did that to a brand new 911 Turbo years ago on 290 because my dipstick tube was not fully seated, ah his face, it was priceless. 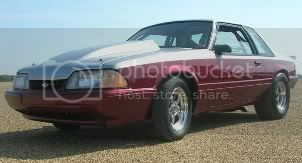 "Go go gadget smoke screen"
Well it is a Foxbody, so it will be smoking, like it or not. Parting one out. That's it. Have my eye on a 66 coupe project but doubt it will happen just yet. My freshened up engine is sitting on the stand, I'll be bolting stuff up to it this weekend. Hopefully it'll be going in the car soon, still would like to do some stuff under the hood since the engine's out. Steadily collecting parts for mine. I haven't made much headway on it lately engagement crap has owned me recently. That and the fact we've been extremely busy at work. If I could ever get my parts off to the machine shop I'd feel like I accomplished something. Been toying with finding a clean 99-04 to daily since I've had my fill of power stroke problems. Mine is sitting at Chris's shop ready to have the new shortblock, longtubes, cams installed and broke in. Its been about a year of collecting stuff and I am ready to get back into it. Mine is siting at chris's shop as well. Just got my badass rearend back from neighbors now waiting on my wheels to be finished at the powdercoaters, then to order the last of the fuel stuff and then it's time to put it all back together and wait for some dyno time..
9.46 with the new combo? Spraying a 408? Did you finally get a good block? Details brother, details!